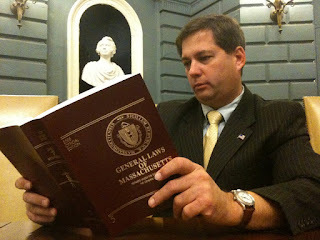 Yesterday Governor Patrick released his budget proposal for the coming fiscal year, 2011. 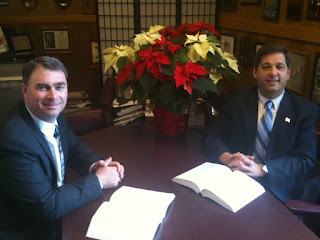 This spending plan is known as H.2, and is available online at http://www.mass.gov/bb/h1/fy11h1/. Our Commonwealth continues to face significant challenges due to the economic recession, and H.2 represents one approach to addressing them. House and Senate proposals will be developed and debated as the year progresses. I encourage you to examine the Governor’s proposal with an eye toward whether or not it contains elements that can spur economic growth and job creation, or whether it revisits modest itemized spending cuts and tax increases to achieve balance. Two items that are of immediate concern as I review the proposal is that once again it proposes a tax increase (on candy and soda), and it increases overall state spending by more than $1 billion. Today I was compelled to appear before the New England Fisheries Management Council in Portsmouth, N.H. to request that it reconsider a recent decision to reduce allowable scallop catch to below levels which are sustainable biologically and needed for the viability of the Massachusetts fleet. This was a case of seeking fairness and sound, rational decision making on behalf of our fishing families. A preliminary news account of today’s events is posted below. 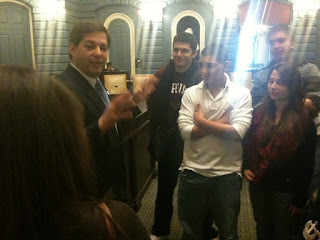 Yesterday I had the pleasure of welcoming students from Anatolia College to the State House for a brief tour and discussion of the role that Greek Americans and Greek culture have played in the history of our state. These students, in Boston to participate in the Harvard Model United Nations Conference, were enthusiastic and engaging. Anatolia College is a special institution, founded in 1886 at the Merzifon Seminary in Greece. Today it is housed on an expansive campus in Thessaloniki, Greece’s second largest city. American operations are based on Beacon Hill. Please visit http://www.anatolia.edu.gr/intro.jsp?extLang=LG to learn more about the school and its history. A recent editorial in the Gloucester Daily Times makes some good points about the Education Reform bill that was signed into law by Governor Patrick on Monday, January 18th. From today's Gloucester Times: "Tarr sees reform in final ed bill"
Today Veterans Service Officers from across the Commonwealth came to visit the State House and discuss issues of concern to the men and women who have served our nation in the armed services. 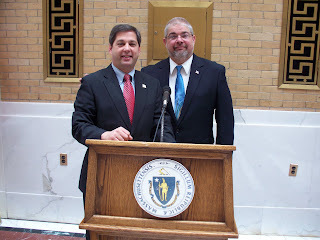 Among the leaders who organized this event was Wilmington Veterans' Agent Louis Cimaglia, with whom I am pictured below. I was pleased to have the opportunity to discuss a number of key issues with Lou, including adequate funding for our Soldiers and Sailors Homes, funding for Welcome Home bonuses for our veterans returning from service in Iraq and Afghanistan, and outreach efforts to ensure that those who deserve benefits are aware of their availability and the processes to access them. Also attending today’s event was Secretary of Veterans’ Services Thomas Kelley, a distinguished veteran who was awarded the Congressional Medal of Honor and the Purple Heart for his heroic actions in the Vietnam War. Tom is always available to assist veterans in our state, and it is an honor to work with him. Today Governor Patrick signed H.4294, “An Act Increasing the Membership of the Board of Selectmen in the Town of Hamilton”, into law. The newly signed law, now Chapter 204 of the Acts of 2009, that I and Representative Hill sponsored increases the number of selectmen from three to five members. This bill accomplishes an important change that reflects the town’s desire for a modern and effective system of government. Through a strong partnership between our legislative delegation and local officials we have been able to meet a major goal developed by the government study committee and endorsed by town meeting. House Bill 4294 also adjusts the selectmen’s term cycle so that not more than two selectman terms run concurrently. Following at least 65 days, at the next annual town election one selectman will be elected to an initial 2-year term and the other member will be elected to a 3-year term. Hamilton follows several municipalities which have recently expanded their boards of selectmen from 3 to 5 members including both Georgetown and West Newbury. Adding two additional members to the town’s board of selectmen will allow the town to tap into increased specializations. An editorial in today’s Gloucester Daily Times analyzes the many troubling aspects of the approval process utilized this year to consider charter school applications in the Commonwealth. I have been engaged steadfastly in efforts to investigate what has occurred in this situation, particularly with regard to the granting of a charter for a proposed school in Gloucester. Persistence has yielded some troubling information, which emphasizes not only the need for the Governor to take action in this instance but also for legislative safeguards to be installed to ensure the integrity of the approval process, which up until now has earned national recognition for its past excellence. Decisions about the proper education of our students must be handled with transparency, accountability and sound reasoning. I remain committed to the inclusion of these qualities in the process. The editorial is posted below, as well as a summary of the amendments which I have added to the Senate version of a pending education bill, S.2205. - Requires the Department of Elementary and Secondary Education to provide to the board a comprehensive written summary of all materials evaluating a charter school application no less than three days before a vote on that application. - Standardizes the process for the waiver of any charter school regulations, and requires a 2/3 vote of the board of education for any waiver. - Requires that the board of education make written findings that any approved charter school meets all the legal requirements for the granting of a charter. Today Rep. Ferrante and I are pleased to inform you that tremendous progress is being made in the revitalization and reconstruction of the A. Piatt Andrew Route 128 Bridge. 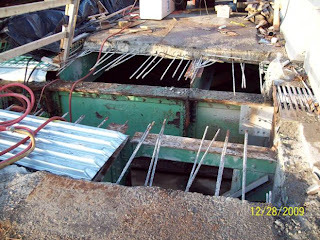 Favorable conditions and extended work schedules have enabled MassHighway and the contractor to reach 75% completion benchmark. The details are provided in the attached report, which also includes a very illustrative photo. We look forward to continuing to update you as the project continues, and wish you a healthy and prosperous New Year! 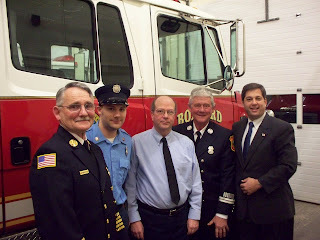 Last night I had the honor of joining Chief Kerry Stickney, the members of the Boxford Fire Department and Selectman Peter Perkins in expressing appreciation to Boxford Firefighter Alan Gould. Alan has served on the department for some 29 years, including periods of service at both the East and West Boxford stations, and as both a firefighter and an Emergency Medical Technician. Since he is moving to Billerica, Alan’s service with the department has ended. We all wish him the very best, and congratulate him on his distinguished service on our behalf. Given repeated examples of errors in the process by which a charter was granted to a proposed school in Gloucester, I requested, along with Representative Ann-Margaret Ferrante, that the State Inspector General investigate the situation. He has now concluded that the process used to grant the charter contravened law and regulation. Inspector General Sullivan has responded effectively to our request, and has committed himself to finding the truth in this matter since our request was first made. In doing so he has once again proven his commitment to promoting the integrity of the law in our state. Please read his letter to Governor Patrick and reports from the Gloucester Daily Times and Boston Globe, which are posted below.